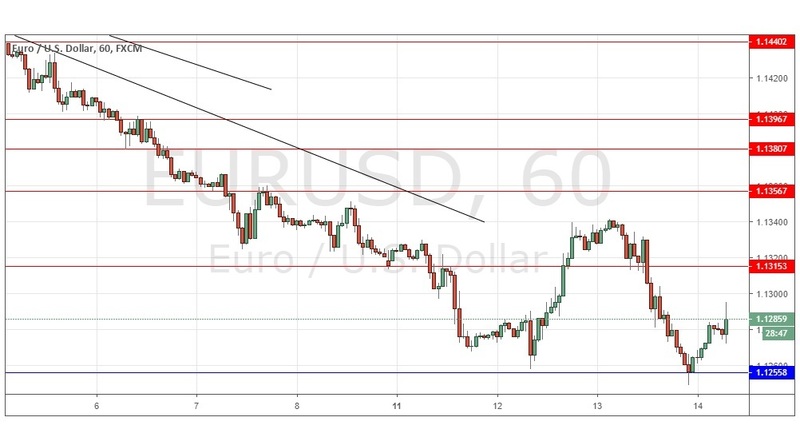 Yesterday’s signals were not triggered as there was insufficiently bullish price action at 1.1315 and the level at 1.1257 was hit well after 5pm London time. Short entry following a bearish price action reversal on the H1 time frame immediately upon the next touch of 1.1315 or 1.1357. I wrote yesterday that the picture was mixed: medium-term bearish trend, but a strong rejection of the bottom of a multi-week range. This suggested the price was quite likely to rise further, but it will be slow and will be a struggle, so trading this pair should be difficult over the short-term. This was a pretty good call as the price did continue to rise before falling back to now create a potentially highly significant double bottom at 1.1256. The price tried to rise but struggled. I think we are at a long-term pivotal moment here, where the price will either break below 1.1250 and move down from this long-term range or rise to get established above 1.1340 and remain within its medium-term range between 1.1250 and 1.1500. The problem for bulls is that the Euro is generally quite weak, and the Eurozone looks like slowing. I have no bias today but a strong break below 1.1250 could be interesting for bears. There is nothing of high importance due today regarding the EUR. Concerning the USD, there will be releases of Retail Sales and PPI data at 1:30pm London time.